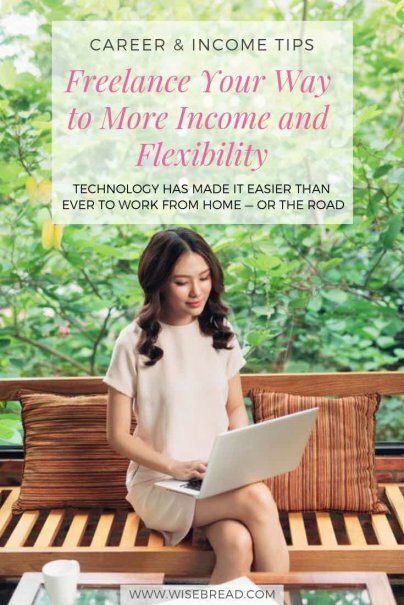 Freelancing is nothing new, but digital technology has made it easier than ever to work as an independent contractor from home — or the road. A 2016 survey by UpWork, a website matching freelancers with companies looking to hire, found that more people are freelancing than ever before, with 35% of the U.S. workforce now made up of freelancers. Why the growth? Employers like to hire freelancers, especially for temporary or project work, because the arrangement is more flexible, and they save on employee benefits and extra office space. Freelance workers gain by getting to choose the projects they want and working flexible hours. It's a work model that offers greater choice for both parties. While freelancing offers concrete advantages, many people worry about giving up the stability and benefits of a traditional job. Losing company-sponsored health insurance, paid vacations and retirement contributions are indeed valid concerns, especially since it takes time to attract new clients and develop relationships with them. For this reason, some people do a combination of both types of work, retaining stability with a part- or full-time traditional job, while also following their passions and earning more money through additional freelance projects. For others, according to the UpWork survey, full-time freelance work actually feels more secure because they have several different clients, rather than relying on one employer for their income. Another major concern that freelancers share is receiving fair compensation for the work being done, as well as losing out on a reliable pay schedule. Freelancers often have to balance a "feast or famine" phenomenon, when they may either have too much work or not enough. Still, the UpWork survey showed 79% of freelancers viewed freelance work as better than working in a traditional setting, and half of them even said they wouldn't take back a traditional job, regardless of the compensation that was offered to them. That's not to say that freelancing is for everyone or for every type of job, but many of those who have decided to pursue this path have found it extremely rewarding. See also: Day Job or Freelance: Which Is Right for You? Freedom and flexibility are two of the biggest draws that attract people to work as freelancers, according to UpWork's survey findings. They feel they have more control over their work schedule by being their own boss. Long weekends are no longer reserved for holidays and special occasions. Many also enjoy the freedom to choose what type of work they want to do and, in many cases, where they do that work. Especially for people who have been commuting long distances or in heavy traffic to get to their workplace, working in a home office can be truly liberating. Plus, if you're just freelancing on the side, the extra cash may help alleviate stress about saving for retirement, travel or education. Gather a portfolio to showcase related projects you've worked on. These may be projects from your current full-time job, or from classes you've taken, or pro bono work you've done to gain experience in the field you want to pursue. A portfolio allows potential clients to see examples of your work to decide if they want to work with you. The better portfolio you're able to put together, the easier it will be to find clients. Depending on what type of freelance work you are going to do, you may want to make a website to showcase your portfolio online. You can also create a portfolio on UpWork, LinkedIn, or specialist websites like Contently and ClearVoice, which focus on content marketing. Like any job, networking is a very important part of finding freelance gigs. You can do this using social media, but you should also focus on real-life networking opportunities through conferences, professional organizations and Meetup groups. There is nothing that can replace the value of meeting people face-to-face. Even social gatherings in your everyday life could lead to valuable contacts. Bring up the work that you do in casual conversations and you'll be surprised how many doors may open for you. If you have a great idea for a project, now is the time to reach out to potential clients and, in a professional manner, pitch your idea to them. There's an art to writing a great pitch. Especially if you're contacting an editor or CEO you don't know personally, you will need to make as good of an impression as possible over email. This is the equivalent of cold calling, so you need to have your pitch polished and well thought out. For writing gigs, it's often recommended to provide a specific outline and an article title. Think about the company's needs, and then send them your best ideas, not run-of-the- mill ideas that anyone could have thought of.